Two area high school students received scholarship checks from Modrall Sperling as part of the recent Martin Luther King, Jr. Multicultural Council’s 25th anniversary celebration. For a quarter-century, the Council has worked to engage the citizens of Albuquerque to build greater understanding, tolerance and appreciation for all who make this city the vibrant multicultural center it is today. A charter sponsor, Modrall Sperling has been a supporter for each of the Council’s 25 years. 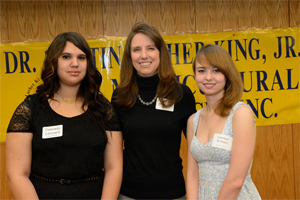 Recipients (pictured with Deana Bennett, Modrall Sperling shareholder) were Cassady Leonard of Freedom High School and Camber Arnhart of Volcano Vista High School.